I was born close to the capital of Portugal, Lisbon. I continued to live there until I was 18, at which point we moved to the city of Lincoln, UK. So my Portuguese is not a mechanical, theoretical one. The language I will teach you is the sort of language people in the country will readily understand and be familiar with. Living in Portugal for the first 2 decades of my life also gave me the full cultural background of the language. Many foreign speakers struggle with idioms, jokes, proverbs, etc., I can “ease your way” in. One of my favourite subjects is languages (not surprisingly! ), how sentences are built, rules of grammar, structural linguistics, etc. I like to understand why something is said in a certain way and where the exceptions to the rule lie. Don’t worry, I won’t bore you with detailed phraseology. Think of me as your mechanic, you don’t need to know how the engine is built to be able to drive, but when you get stuck, I’ll be there to help. The following courses, consisting of more than 45 hours of lectures by the world famous linguistics professor John McWhorter has helped us understand what this thing called “language” is really all about. It made us realise how many fallacies we accept as truth and how much traditional language teaching can be improved upon. Originally created to help people enrich their english vocabulary, the principals and tricks expounded within this course are incredibly practical for foreign language learning too. This course gives us an outlook on how languages evolve in a colonial environment. It also helps us understand the prejudices of speakers of the same language, divided only by culture. How can someone be a good language tutor if they don’t grasp the very essence of what a writing system is. This incredible course helps us understand why we have one in the first place. Over the years, the following works have given us a different understanding of how humans learn and how conventional teaching is so unproductive. Michael Erard literally travels around to world to talk to hyper polyglots in search of the key that enables some to speak and write in half a dozen or more languages. This renowned linguist shows how language is evolving and why we should embrace this transformation. This is profoundly important for a good teacher. Dr Dehaene, using innovative techniques shows how much consciousness and language relies on the unconscious circuitry of the brain. We can stimulate memory without forcing it in. This is by no means an easy read, but it will give a very good idea of how the brain structures grammar and vocabulary. Makes you realise how little we do, language-wise, consciously. Marco is a pragmatist and in this work he sets out to expose some of the misconceptions the native Portuguese speakers, in general, have about their own tongue. More known for his humorous books, let’s not forget Bill Bryson is, after all, a master at manipulating language. In this book he delves into the history of languages, specifically, the english one. John Medina here outlines 12 “brain rules” for effective learning. He then goes on to explain why, in detail, the brain works that way and how the rule can be applied. This fascinating book is a result of years of research and provides us with a set of directives to follow if you expect to have information “stick” in your mind. 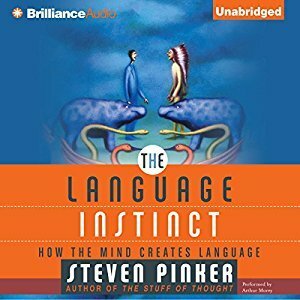 One of the most influent linguists of our era asserts that language is, well…a human instinct and as such we possess innate mechanisms to learn it. We must adapt the learning strategies to the pattern already inbuilt in our brains. Unlike what scientists used to think, the brain is incredibly malleable and plastic. Understanding this and how to force the brain to adapt is one of the keys to learning a new language. “Why things catch on” is the subtitle of this book. If you’re trying to learn a new language, there is nothing more important than figuring out how to get information stay put. What exactly makes your brain “view” something as pleasurable? By giving us an understanding of the mechanisms involved, David Linden shows how even language learning can be made into an enjoyable experience. For those who want a basic understanding of how language works this would be a pretty good start. It’s no little thing that is it is also written by one of the foremost linguists of our time. This professor of psychology explains how so much of what we do and think is driven by irrationality. It also provides steps for getting the most out of our conscious brain power. This New York Times bestseller is a gem when it comes to helping us understand the brain’s capabilities of learning, either on a conscious or an unconscious basis. An absolute must to understand the basis of human cognitive capabilities. A constant companion for many psychology majors, this compendium can do much in correctly assessing what works and what doesn’t in learning. Habitual memory is intrinsically connected with languages and the capacity to communicate. This New York Times bestseller does wonders in helping us harness the power of the habit. Ever thought doing some running would help you memorise vocabulary? If you said no, you’re not alone. But this book and it’s research will prove you wrong. The history of the english language tells us much about how languages change over time. This is an excellent (another) book by the one who is now our favourite linguist: John McWhorter. Written by the famous linguist and his son. This is an excellent, and great fun, book on accents and pronunciation. We would recommend the audio version. Little known outside the religious group, but incredibly powerful. This publication arms any teacher with the most effective techniques for imparting information. If you looked at our bookshelves you’d probably think we collect European Portuguese grammar books. There are too many to mention here and most of them are pretty boring too. But recently we’ve been enjoying a collection of books dedicated to various aspects of our mother tongue written by Portuguese linguistic scholars. It’s called: “O Essencial Sobre Língua Portuguesa”. The famous Dr Cotton has trained thousands of language teachers around the world be dramatically more effective and motivating with their students. Consolidating much of the research done in recent years and adding more than 30 years of experience, Dr Harry Cotton, from the Canadian Institute of English puts together an exclusive course specifically designed for language teachers. This is not your conventional lecture-filled seminar, it is a hands-on interactive program filled with practice sessions. The course empowers the teacher with the best tools to engage the class’s brain power. Even though I personally did not attend the course, my husband has, and I have access to all the resources, techniques and information there provided.